I decided to go with the cat one. You’re welcome. 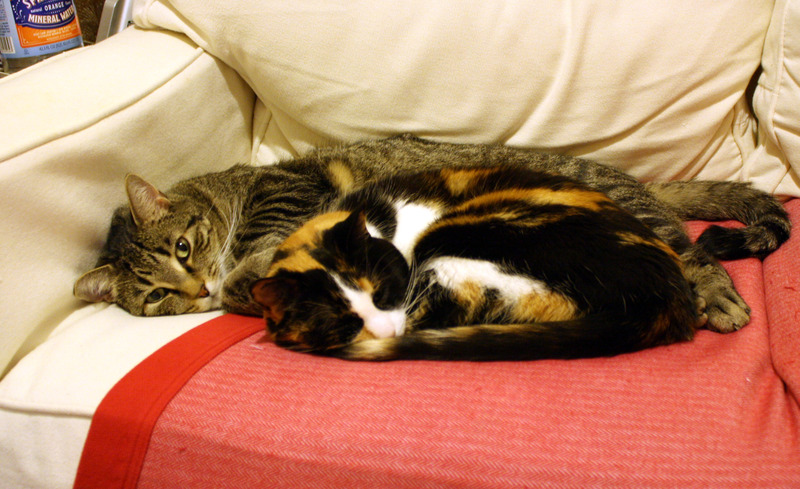 Want to do something special for your cats on Valentine’s Day? Serve them a lovely homemade chicken and gravy dinner and give them a nice gift, like a CatSofa or a Squeaker 3000 Robotic Toy Mouse. You really get the oddest search terms, Laura! How do you do it?! If she misses out on getting a special dinner and gift because she prevented you from reading the suggestions at the very end of the post, then she has only herself to blame. Hahaha! People can be so imaginative with words. I think you chose a good one. Kitties! I love the calico! Don’t tell the other cat I said that. The calico is Holly, and the tabby is Thunder. Last year’s Valentine featured a picture of Thunder biting Holly’s ear. My cats don’t exactly go for the traditional Valentine’s Day poses. (Don’t tell them they are cute – it only goes to their heads…) Happy Bloggentines Day to all the household! I’m pretty thrilled that you went with the cats over your other options. Whew! Besides, I like cats. My own 3 gave me a hairball for Valentines! They’re thoughtful like that. My cats don’t really do anything special for me on Valentine’s day, but they show their love by presenting me with hairballs throughout the year. I dunno you guys, I think a zombie Marilyn Monroe holding a heart would be awesome. The cats are adorable though, so there’s that. Do you mean a heart shape or an actual human heart? Cats would be a lot more into Valentine’s Day if those hearts contained tuna instead of chocolate. Aw, they loves each other. In a “two fur coats are better than one” sort of way. I, too, think you made the right choice but you should hold on to Marilyn for future blogginess. They do. When they’re not squabbling with each other, that is. I always have good intentions, but who can resist from eating the Squeaker 3000 Robotic Toy Mouse and playing with the Chicken and Gravy dinner before they ever make it to the cats?! Wait… that might have come out wrong. See, this is why you should always read the instruction manual. It says right there on page 32 that you’re not supposed to eat the Squeaker 3000. Printing the manual on chocolate was probably a mistake. Aah sweet! I hope the two Unlikely Explanations cats had a good Valentine’s Day. Did you give them a special treat? They got to watch me eat some chocolate. What could be more fun than that? I passed your compliment along, and they said “Hey! We’re trying to sleep here!”. They’re very gracious. I probably could have combined the flies with Marilyn, now that I think about it. I kind of like cats. I’m not sure whether I’ve mentioned it before.